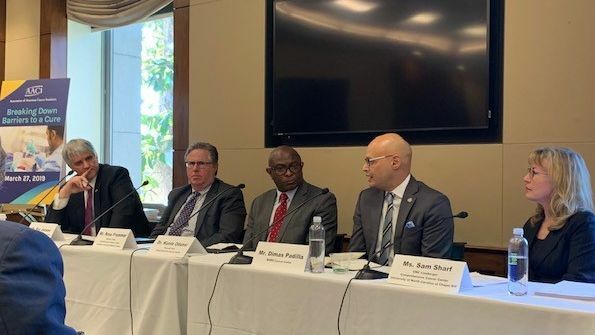 On March 27, AACI held its 2019 Congressional briefing, moderated by AACI President Roy A. Jensen, MD , director of The University of Kansas Cancer Center. In case you missed it, here are some highlights. Dr. Odunsi, deputy director, chair of the department of gynecologic oncology, and executive director of the Center for Immunotherapy at Roswell Park Comprehensive Cancer Center, presented a scientific overview of chimeric antigen receptor T-cell (CAR T) therapy. ﻿He described how the revolutionary immunotherapy uses a patient’s own genetically modified T cells—white blood cells that fight disease—to find and kill cancer cells. In 2017, the Food and Drug Administration (FDA) approved tisagenlecleucel (Kymriah®) and axicabtagene ciloleucel (YESCARTA®) CAR T-cell therapies for the treatment of certain relapsed or refractory leukemias and lymphomas. 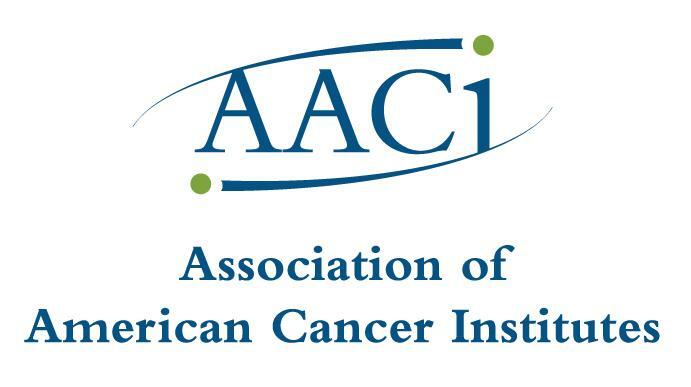 More than half of AACI’s member cancer centers have been approved to provide these therapies, but many institutions encounter barriers to providing CAR T to all qualifying patients. In 2018, AACI launched a CAR T Initiative to address these challenges. "It is now clear the immune system is the most powerful weapon in the fight against cancer." Sharf, clinical director of the Bone Marrow Transplant and Cellular Therapy Program at the University of North Carolina, Chapel Hill, addressed administrative barriers surrounding CAR T therapy. 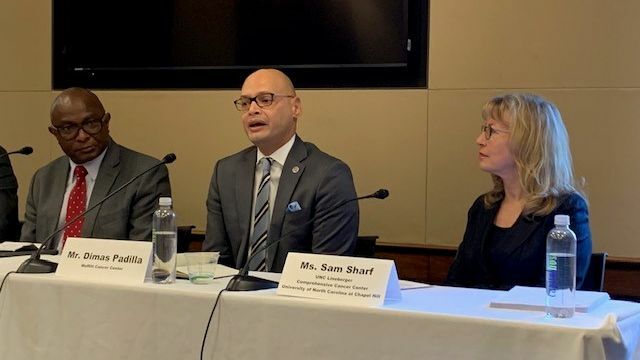 Although CAR T is reserved for patients with limited options, Sharf stressed that it must be accessible to all patients who meet the FDA-approved clinical indication for the therapy — regardless of payor. She said the new CMS decision memo for National Coverage Analysis could present logistical challenges for hospitals and cancer centers. Current Medicare regulations cover only half of the cost of care, putting hospitals at financial risk and slowing down critical care for patients. Padilla is a three-time survivor of non-Hodgkin lymphoma. When he received his third diagnosis—after numerous rounds of chemotherapy, a stem cell transplant, and a bone marrow transplant—he was given a prognosis of just six months. Seemingly out of options, Padilla—a husband and father of two young daughters—was sent to Moffitt Cancer Center, where he was enrolled on a CAR T clinical trial under the care of Dr. Frederick L. Locke. In a remarkable turnaround, he began to see the effects of CAR T within 48 hours — and he remains cancer-free today. "I would have saved five or six years of my life if I had the opportunity for CAR T from the first diagnosis." Frommer, vice president for government and community affairs and associate dean at Columbia University Irving Medical Center, discussed the importance of stable predictable increases in funding for the National Institutes of Health (NIH) and the National Cancer Institute (NCI) to enable scientific breakthroughs — including CAR T therapy. He noted that while proposed budget cuts to the NIH would be devastating, there is hope that Congressional champions will raise budget caps and increase funding for Fiscal Year 2020 to $41.6 billion.